In it of itself, the city of Osaka can be a very overwhelming place. It is constantly busy, filled with people walking the streets and famously has an incredible abundance of restaurants in every corner and alley. Even in Japan, it is oftentimes very difficult to find a restaurant that serves vegetarian food, and Osaka, the food capital of the country, is no exception. To help guide you through the myriad of restaurants that may be limited in their vegetarian options, we have listed some of our favourite picks of vegetarian restaurants throughout the city. These are perfect resting spots to nourish and relax, in a city that will likely overwhelm your senses. Amongst many things, a must-eat when in Osaka is a bowl of piping hot ramen (traditionally slurped down by patrons) in one of the many restaurants dotted throughout the city. However, most ramens are not vegetarian friendly as they use a pork-based broth that is unsuitable for a vegetarian diet. Luckily, Yuniwa Veggie Ramen offers a new refreshing approach to ramen: a delicious array of choices for those who hunger for a taste of ramen. Learn how to eat ramen properly in Japan watching this video: Click here to watch.Yuniwa has full confidence in the quality of the ingredients that are utilized and they believe this sets the foundation for a tasty bowl of ramen. 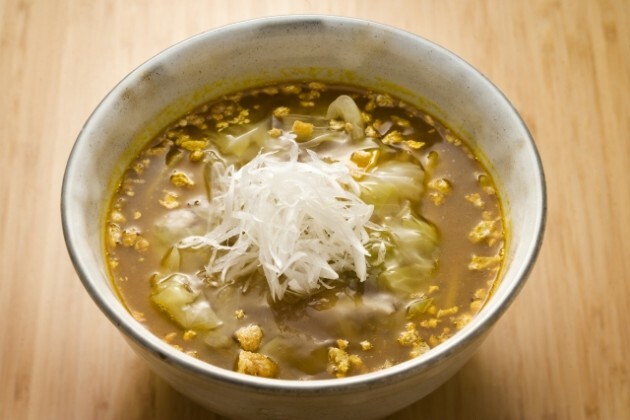 All of their dishes are free of chemical additives and animal products and primarily rely on the flavor of vegetables and konbu (seaweed) to draw out a mouthwatering flavor. Yuniwa also serves an original organic beer that they describe as fruity and mellow and will be a perfect mid-day compliment to your bowl of heartwarming ramen. Price Range: Moderate. 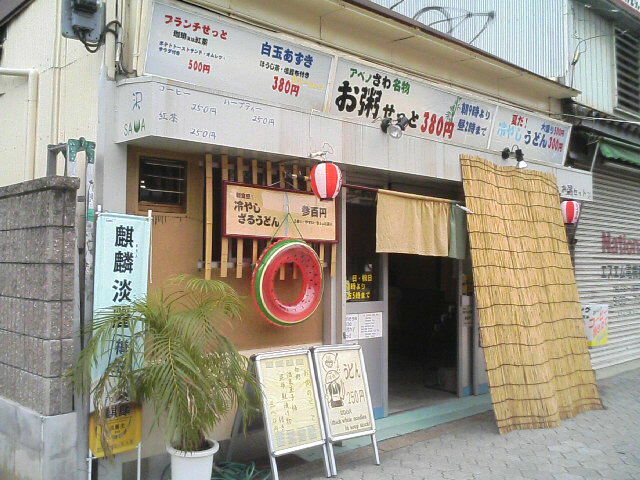 900- 1200 yen for meals (excluding beverages). 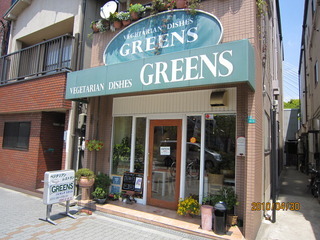 Greens Vegetarian Dishes is a small buffet-style restaurant located near the Tempozan Market Place and Osaka Ferris Wheel. Look for the giant ferris wheel and directly opposite of that landmark you will find Greens Vegetarian Dishes. One of the main words to describe this resto is value: for only 800-900 yen (excluding beverages), so you can fill up on the hearty and healthy meals prepared with love at this buffet. This should certainly kill the myth that Japanese food is expensive. There is a salad bar, two main dishes served, soup and dessert, and legend has it that their bread is phenomenal. If value isn’t enough of a reason to check out this veggie resto, then you should know that Greens Vegetarian Dishes also serves as an NPO that provides support to people with disabilities and trains them to partake in positions at their restaurant. Access: Near Tempozan pier and Osaka Aquarium, restaurant is directly opposite giant ferris wheel. Price Range: Around 1000 yen (Cash only). Hours: Mon-Wed, Fri-Sat 11:30-14:30, closed Thursday and Sunday. Green smoothies have recently taken the West by storm as an elixir guaranteed to provide beauty and health. Japan seems to be slowly catching on to this trend as well. Green Smoothie Bar serves green smoothies and raw food, as well as desserts, coffee, fresh juices and Yogi tea. If you are seeking a place to nourish yourself and cleanse from the inside out, Green Smoothie Bar is the place to visit to kick start your healthy beginnings. Hours: Tue, Wed, Fri-Sun 11am-6pm. This small restaurant is the perfect spot for those groups who require both vegetarian and non-vegetarian choices for lunch. It can oftentimes be difficult to find a restaurant in Japan that successfully serves tasty food for those with all kinds of dietary requirements. The owner of this restaurant uses fresh organic produce from his farm to prepare his dishes. The set meals are usually 500-800 yen, the food tastes homemade and the interior is decked out with surfboards, kayaks and Buddhist images. For a more “local” experience, visit Sawa. Access: A 3-minute walk from Abeno subway station (exit 6) or 10 mins from Tennoji station. Price Range: Inexpensive. Around 500-1000 yen. If you are interested to know more and save your time during your trip to Osaka, You can send a message to our local guides to get a customized itinerary and quotation for an unforgettable experience. Hero was awesome! He took the family around Osaka to try out street foods and keys sites. He was also very helpful when we needed a stroller for my son who got sick. He went out of his way to call people and find us one. He was very flexible and accommodating. He is also very fun to be around and easy going. We would highly recommend him! Thank you Hero!!!! Masahiro was so good. We were able to communicate easily and his knowledge of Osaka was excellent.